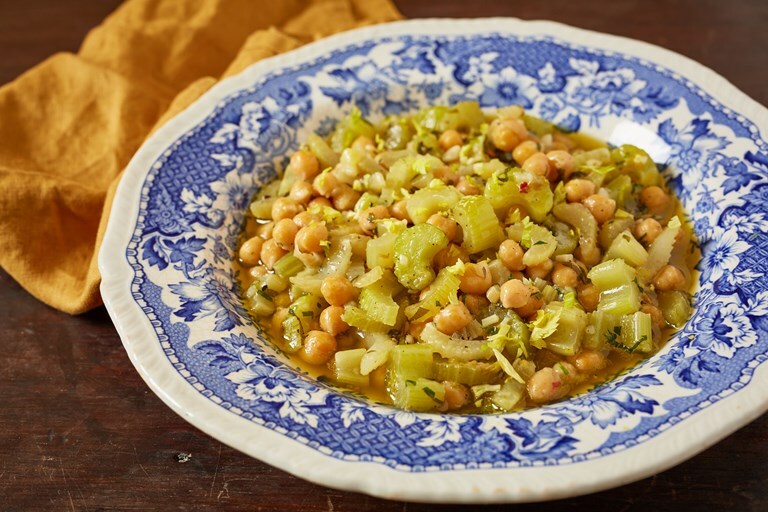 This Italian-inspired recipe for braised chickpeas and celery from chef Anna Tobias highlights the wonderful fragrance of celery. The dish takes a vegetable so often used for nothing more than a soffritto and pushes the under-appreciated stalks into the limelight. Take a look at Anna's other recipes that put celery centre stage here. This recipe highlights the wonderful earthy sweetness of celery. It's a twist on a classically Italian way of serving pulses, where the pulse is tossed into sizzling parsley and garlic and served just so. The addition of celery adds depth of flavour and aroma. Whilst some forethought is required in soaking the chickpeas, the actual cooking is very simple indeed. This dish is delicious eaten on its own as a light meal, but can be made more substantial as a lunch dish with the addition of a soft boiled egg. Alternatively, it is a fantastic side dish to any grilled meat, especially pork and chicken.